This half-length neck strap is designed for displaying an American-style cowbell in the home or at sports games. This item will not fit a real cow. If you want a strap for a live cow, please purchase our full-length cowbell strap. 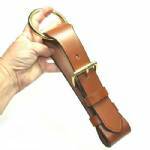 The strap will be 22" to 24" long from buckle to tip. It can be flattened into a strap for display (as shown) or it can be buckled to form a circle. When the strap is flattened as shown in the photo (left), the total length of the strap and ring is 10 inches, give or take an inch or so.